Denis O’Brien’s Editorial Interference: The Smoking Gun? Leslie Buckley (right) was appointed as Denis O’Brien’s representative to the board of Independent News and Media (INM) in 2009. 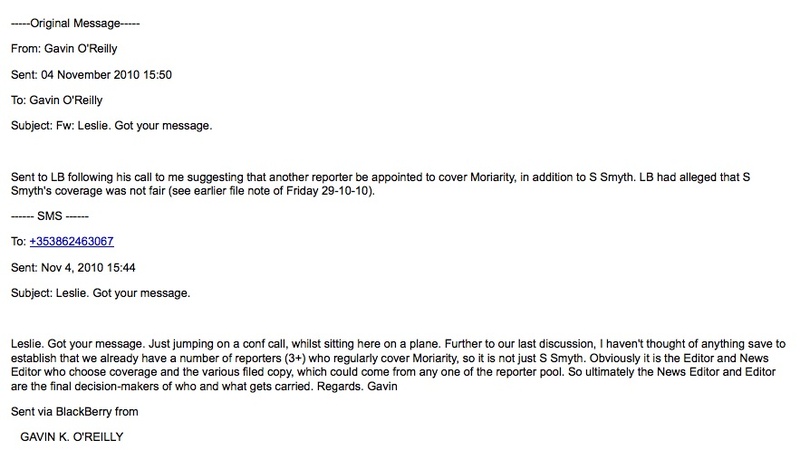 The following correspondence took place during the final stages of the Moriarty Tribunal. Journalist Sam Smyth was covering proceedings for The Irish Independent. Gavin O’Reilly (left) is CEO of INM. I got your last text message sent on Sunday morning at 8am. Frankly, I am somewhat bemused by the plethora of calls and texts; I am not sure what is so incredibly urgent that it has required the host of phone calls and texts in the past week or so. 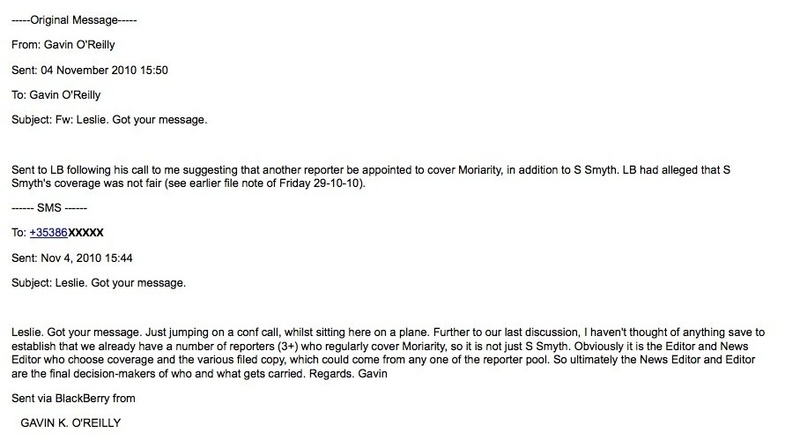 You called me last Friday week (29/10/10 – when I was in Delhi) – and said that you and Denis felt that Sam Smyth should not continue his Moriarity coverage, as you believed that he had a vendetta and that his coverage was not balanced. However, in no discussion (then or since), have you specifically indicated where Sam’s coverage is either deficient or incorrect, except to say that the Tribunal was winding down and that other coverage was more positive. Instead, you referenced Sam’s participation on RTE’s Primetime with Sarah Carey. In fact, you’ll recall that you actually said that Sam’s article in the Indo that day (Friday, October 29th) was “very good”!! I said to you that I couldn’t see any basis on which the Editor or Sam himself would agree to any change – and furthermore, I counselled that it’d be a page 1 story in The Irish Times. I also reminded you that Sam’s involvement with this story goes all the way back to the start, Lowry/ Dunne etc… You seemed to accept this pretty self-evident logic, and so I naturally thought the issue was dead. We then spoke again on Tuesday (after the Board meeting), when you asked me to call you. You said that you and Denis accepted that Sam couldn’t be stood down, but that you’d both like to see another person covering the Tribunal (in addition to Sam). I responded by text saying that there were a number of reporters that cover Tribunals, and that the decision of which writer and which copy was used was the preserve of the Editor and News Editor. You then left me another voice message on last Thursday evening, saying that there had been positive events at the Tribunal and that Sam’s coverage was pretty negative. I responded by text on Friday evening saying – not only were the Tribunal’s public hearings ending – but that I had reviewed the coverage (which seemed to me to be exactly the same as the other papers) and I couldn’t see any lack of balance that you suggested. Leslie, I have listened to, and considered very carefully, your various messages again and again and looked again at all the coverage, and frankly, I can’t agree that there is anything wrong, inconsistent or unbalanced with Sam’s coverage. 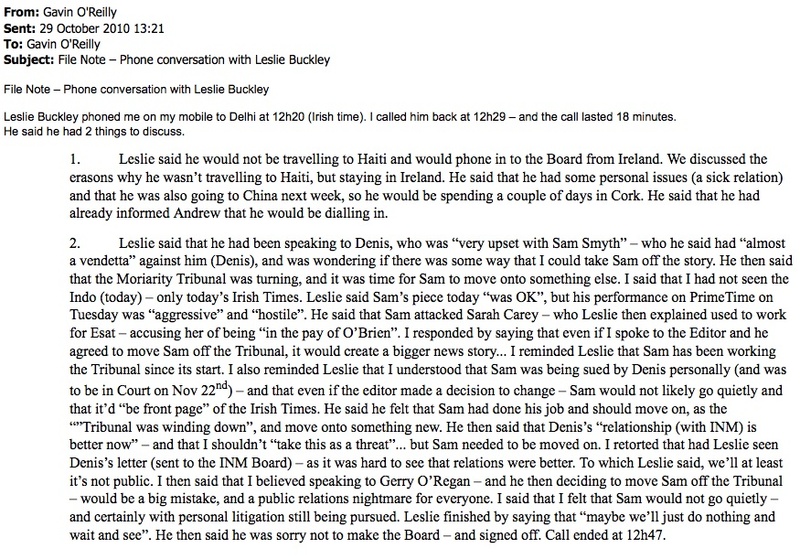 I know that there are obviously personal issues between Denis and Sam (threatened legal actions etc…), but I’d suggest that any objective review of the Indo’s Tribunal coverage – which is, in effect, just plain ole Court coverage – confirms that Sam has played a very straight bat with the facts (all of which are in the public domain). I advised you last week that the issue that you are raising goes to the very heart of INM’s policy of editorial independence. In addition, you must surely agree (privately) that Tribunal coverage cannot be adjudicated or influenced by people that are a party to the Tribunal. And all that said, this entire debate seems entirely redundant at this stage anyhow, for the specific reasons set out above (not least, the Tribunal having ended). Therefore, I can see no sensible basis for raising this matter with the Editor, as to do so would be viewed (in public, at the very minimum) as direct interference on editorial matters — which not only would represent a major deviation from the past (and the Board’s policy) — but I’d strongly suggest, would be a hugely retrograde step for this Company and our brand. Hope your trip to China proves fruitful. Posted in Misc on 12:31 pm by November 21, 2011 .